The recalled bunk beds do not comply with federal safety standards and have wooden side slat supports that can separate from the bed frame, causing the upper bunk to collapse. The recall includes about 500 twin bunk beds designed for children and sold in a kit to be assembled by consumers. Only model number 82008 is included in this recall. The bunk beds are made of maple wood with a four-step ladder attached to the side and three pullout drawers under the bottom bunk. These bunk beds have no markings or labeling. Specialty furniture stores nationwide and on various Web sites from December 2004 through April 2006 for about $600. If you have not already received and installed a free repair kit for the side slat supports, immediately stop using the bunk beds until repairs can be made. Contact the company to receive a free repair kit that can easily be installed at home. 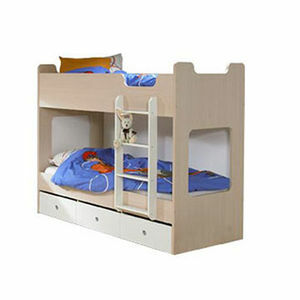 Retailers have contacted some consumers who purchased the bunk beds directly. For more information, contact d-Scan Inc. at (800) 932-2006 between 8 a.m. and 5 p.m. ET Monday through Friday, or visit their Web site at www.tvilum-scanbirk.com.